Organization of events planned for Year of the Environment was the subject of discussion. 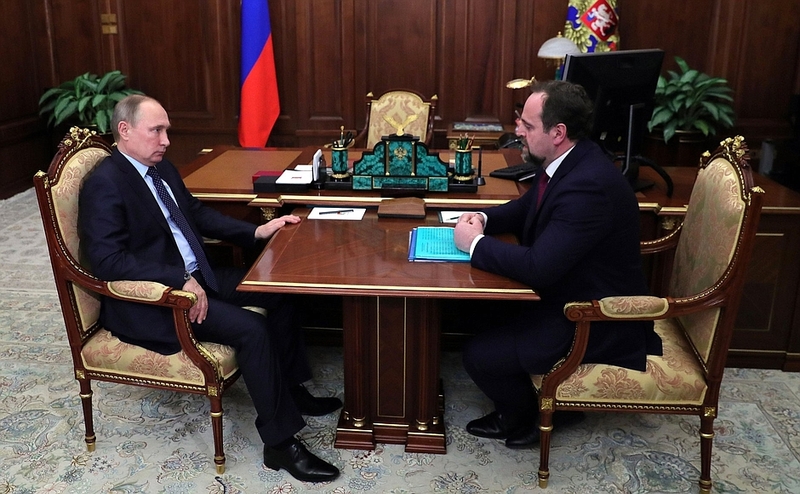 Mr. Donskoy also briefed Vladimir Putin on work to update subsoil use licensing procedures. Mr. Donskoy, we have declared next year the Year of the Environment. This is to some extent just a convention, because we cannot devote attention to literature, culture, or the environment for just a year and then forget them. But this convention does give us the chance to focus our attention on the most serious issues and problems. How does your ministry, as the relevant body in this area, plan to organize this work? Mr. President, the Government already approved a program of activities for Year of the Environment in the first half of this year. The program includes around 600 events at various levels. We are in the process right now of preparing for these various events. We estimate the total budget for these events at around 350 billion rubles. The bulk of these funds will come primarily from extra-budgetary sources, because the program includes work to modernize private companies too. The regions, together with investors, will promote initiatives to develop waste management systems. We moved the start of work to implement this reform back a little, but it will start next year and a number of regions are ready now and have already started implementation. We also have the task next year of adopting the relevant Government decisions on establishing new protected nature reserves and national parks. The necessary preparation work for this was completed this year. We will also be putting the focus next year on regenerating forests and on water purification. Overall, the work program for the Year of the Environment is divided into eight main sections. They include Lake Baikal, major wildlife projects, returning animals to the wild, and regenerating populations of animals in danger of extinction. The project is ambitious in scale. Over this time, in order to oversee this work’s implementation, we are signing agreements with the companies so as to have an effective supervisory tool for carrying out these activities and the companies’ plans next year. Overall, we hope, of course, that everything we have planned for the Year of the Environment will be important and produce effective and large-scale results for all who have an interest in a clean environment and nature. I don’t think there is anyone who doesn’t have an interest in this. Good. Is there anything else you wanted to say? Yes, I wanted to brief you on the work we are carrying out on your instruction concerning one-off updating of subsoil resource use licenses. You gave the instruction in 2015 to carry out this one-off updating. The main task is to bring all licenses currently held by subsoil resource users in line with the laws in force. Many of the licenses were issued back in 1992 and were not subsequently amended at all. By updating them now, we give them all a common form, for starts, and we are updating too the figures and information contained in the project documentation too. The licenses that have been updated all share a common form now, and the information that needs updating in the project documentation is updated. As at December 1, more than 4,000 licenses – 4,467, to be precise – had been updated, of which 84 percent were for hydrocarbons (2,380 licenses) and 2,087 licenses were for solid minerals. We have thus updated practically 100 percent of all licenses that needed updating. Let me say that this one-off updating has enabled us to increase the number of obligations set out in the licenses. We have set out in the licenses project obligations for newly prepared projects. The number of obligations the licenses set out has increased by 25–30 percent. We are seeing another trend too. Previously, subsoil resource users withheld geological information, seeing this as a commercial affair. We accord licenses and subsoil resource use rights to the subsoil resource users, but the resources themselves belong to the state, and so the state authorities should have access to this geological information too. Companies all want to have their licenses updated, and so they tend to be more willing now to hand over the geological information because if they do not do this, if geological studies are not carried out, or if licenses have payment debts, we do not update the licenses. These were the conditions set in accordance with your instruction. Overall, the licensing system is becoming more transparent and clear, and investors have an interest in having this kind of license. It is convenient for the state authorities too in terms of inspections and relations in general with the subsoil resource users. We think that the updating process has made it possible to stabilize to some extent the amount of geological investment over this period, taking into account the noticeable current global trend for a decrease in investment in geological exploration. Let me note that over the last three years now, we have at the very least regeneration of hydrocarbon reserves. Currently, reserves have increased by 575 million tons. Gas reserves have increased. With production at 572 billion cubic meters, natural gas reserves are expected to increase by 701 billion cubic meters. Coal reserves have also increased considerably, with an increment of 502,000 tons and production at 387,000 tons. We have an increase in gold deposits of 1,194 tons, with production at 293 tons, in other words, substantially more than the production level. We have an increase in silver deposits of 5,818 tons, with production at 2,440 tons, essentially twice higher than the production volume. In order to move over to more systematic work now, we are drafting a law on updating licenses. This will no longer be one-off process but a systematic one, setting a timetable for ongoing updating work and thus harmonizing the system of relations between the state authorities and investors. Mr. Donskoy, this updating work has turned out essential, it seems. It amounts practically to renewing licenses. In some cases, licenses are subject to renewal, and in other cases we simply formalize obligations that were not in the license previously. In 1992, some licenses did not even contain obligations to carry out work. Yes, this must all be brought up to date, and it is important that the subsoil resource users understand that this situation could not last indefinitely. If they obtained licenses, they need to work, invest the resources and organize production. If they are not doing this, unfortunately, we will need to revoke their licenses. I think that this will tighten discipline for those who choose to stay and genuinely work. Mr. President, let me add that we have already revoked more than 140 licenses during this updating process, precisely in cases where companies were not respecting the conditions and it was clear that no updating effort would be of help. Plus, we have not updated all licenses in the situations I mentioned. In cases when work is not being carried out, for example, and when geological information is not handed over – and if work is not being carried out, then there is no way of handing over geological information. The same goes for cases where there are tax and payments debts, in this situation too we do not update the licenses. This means that as the one-off updating effort ends now, those of our colleagues who did not get their licenses updated in time will work under a system in which [federal environmental regulator] Rosprirodnadzor will visit them and from there, if they do not take action to get work underway, then, as you say, their licenses will be automatically revoked. Minister of Natural Resources and Environment Sergei Donskoy. 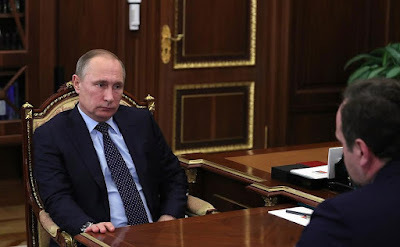 Vladimir Putin meet with Minister of Natural Resources and Environment Sergei Donskoy. Putin at the meeting with Minister of Natural Resources and Environment Sergei Donskoy. 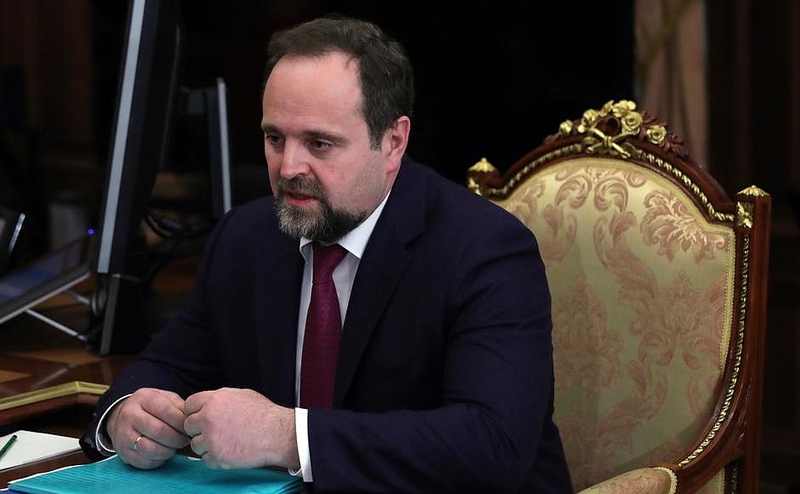 0 Comment to "Putin met with Minister of Natural Resources and Environment"